It was good to be able to attend our Abbots Wood walk, thanks to help from friends Tony, Sue and Terry. 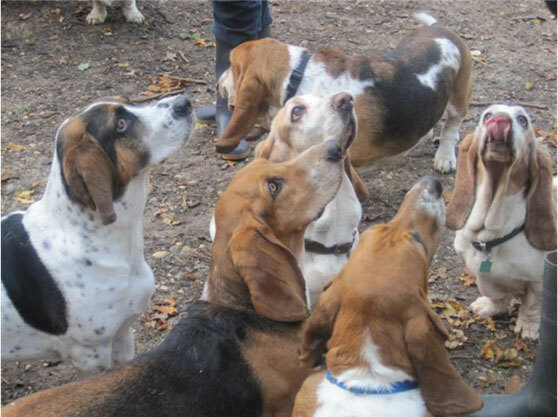 We were very pleased to have a total of twenty two hounds, together with their owners. The weather was ideal, lovely sunshine. Jill and Brian had returned from holiday on Saturday evening, and decided to join us, the alternative being a huge amount of washing and settling back into their routine - no contest! We went on a rather shorter walk than usual, owing to the fact that I took a different route and missed out on seeing the lake - apologies to everyone. We ended the walk by visiting the local pub (commonly known as ‘Hector’s House’ due to the Basset who lived there many years ago). We all sat in the gardens, together with the hounds, enjoying everyone’s company and the beautiful weather.